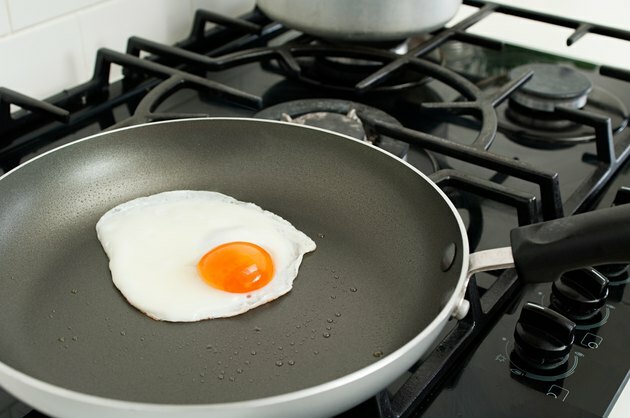 If you're looking for a healthy protein source that won't break the bank when it comes to fat, look no further than the easy-to-obtain egg white. The scientific term for the goopy, clear part of a raw egg is albumen, according to Exploratorium.edu, and comes from the Latin term for "white," thus giving it its common name. 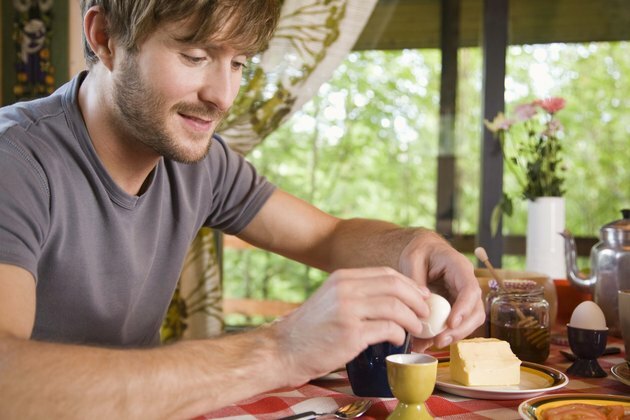 Understanding the nutritional facts for the egg white can help you make smart dietary decisions. 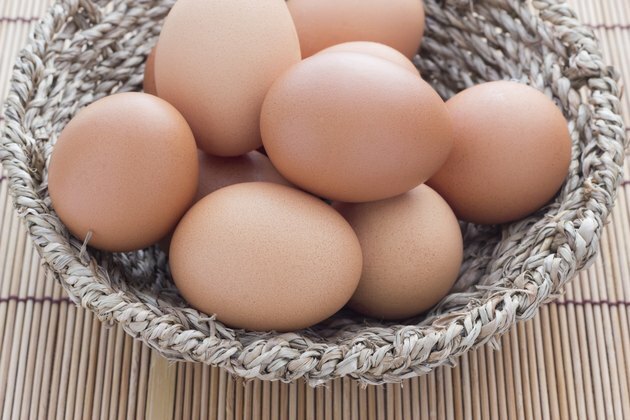 According to the U.S. Department of agriculture, egg whites contain 0 g of fat per serving. There are traces of fat, but not enough to register, according to the U.S. Food and Drug Administration's requirements for food labeling. According to the USDA, the exact amount of fat in 1 cup of egg whites is 0.41 g.
In addition to being fat-free, egg whites are an excellent source of protein, containing 3.6 g of protein per large egg. That means for an entire cup of egg whites, you would get a whopping 26.5 g of protein. Better yet, by eliminating the yolk, you've also eliminated the cholesterol. 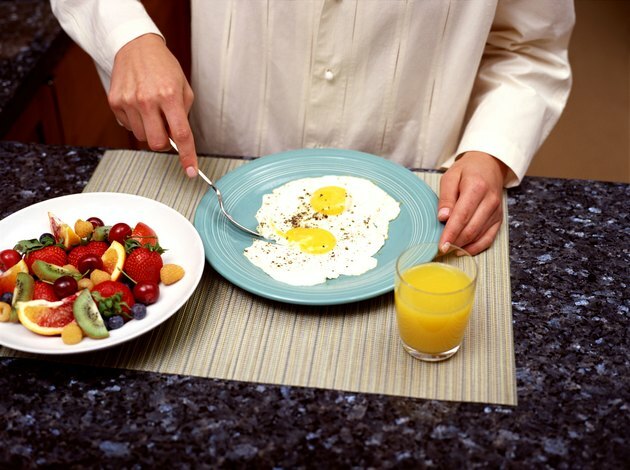 One egg white contains approximately 17 calories, giving you a total of approximately 126 calories for an entire cup. Also, in 1 cup, you would get 1.7 g of sugar and 403 g of sodium. If you're going to enjoy the health benefits of egg whites, you'll need to separate the egg from the yoke. While there are some commercial products that allow you to do this, it can also easily be accomplished by hand. To separate a yolk from the egg, crack an egg slightly over a bowl. Open the cracked egg so the yolk gets trapped inside the shell. Turn the egg and separate the shell so the yolk rests in one half of the shell. The excess egg white from the other half of the shell will fall into the bowl. Transfer the yolk to the other half of the shell, which will help even more of the egg white to be released into the bowl. Repeat this process several times until most of the egg white is in the bowl, then throw away the yolk and shell. Although protein is essential to your diet, many animal protein sources contain high amounts of saturated fat, which has been linked to heart disease and high cholesterol. Egg whites can be used in a variety of ways to help complement your diet and provide a healthy, fat-free source of protein. At the same time, they are low in calories, helping you manage your weight. Because protein helps you feel more full, egg whites can help you curb your cravings later in the day. 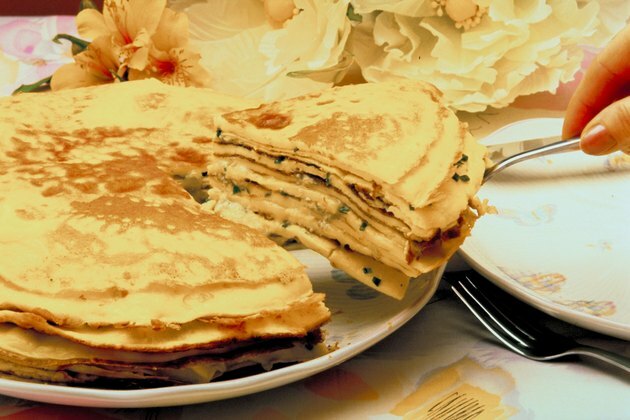 Egg whites are probably most popular in the morning, when served as an omelet with a variety of toppings, but that's not the only way to eat egg whites. If you're looking for a way to enjoy fried food without the fat, whisk up a couple of egg whites and dip your favorite cut of chicken or pork in the whites, then roll the meat in a pile of bread crumbs. Bake in the oven, and you'll have a fried texture without the oil.